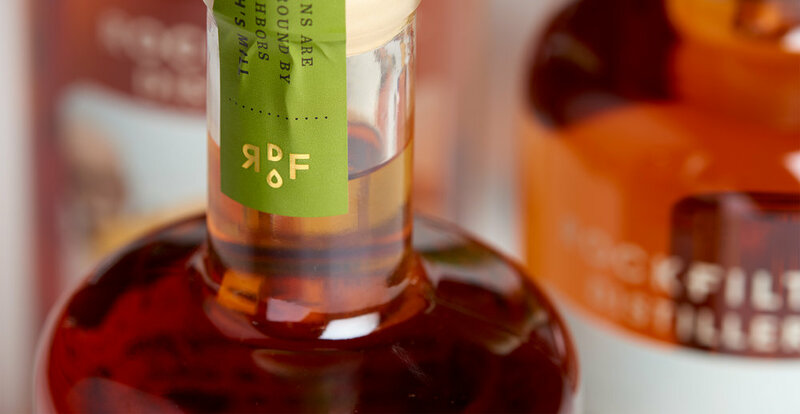 RockFilter Distillery identity designed by Abby Haddican and Sarah Forss at Werner Design Werks. 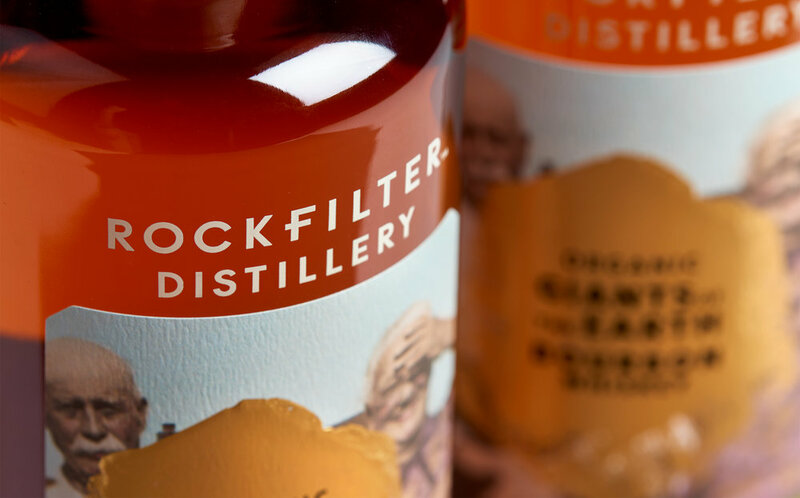 RockFilter is an organic farm distillery in Spring Grove, Minnesota. RockFilter’s founder and head distiller, Christian Myrah, is a fourth-generation Spring Grove resident whose ancestors helped found the town. Christian raises all the organic grains for RockFilter’s small batch spirits on his 350-acre family farm. 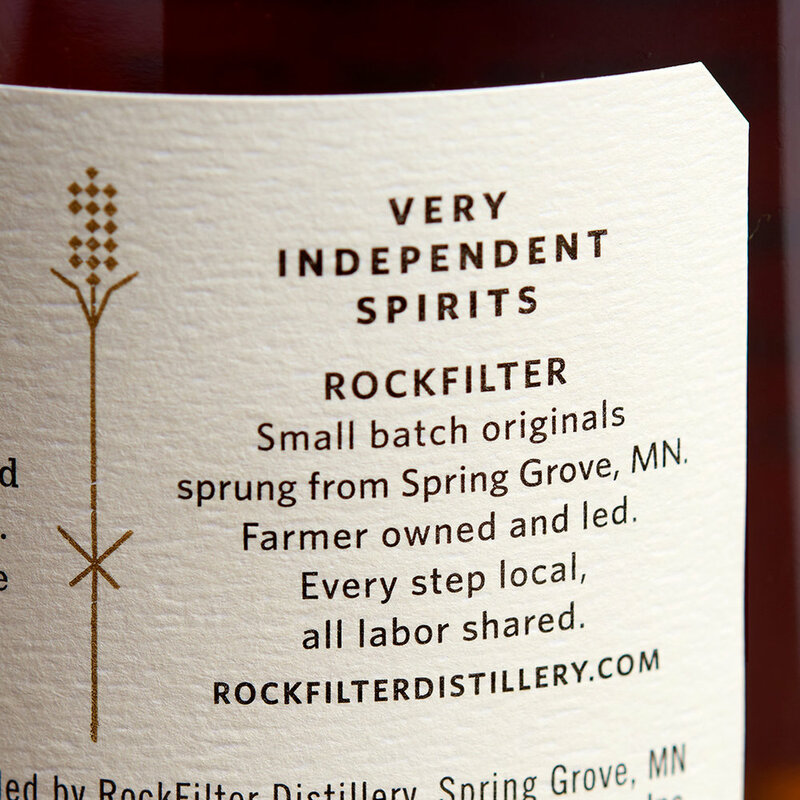 Behind every variety of RockFilter whiskey, there’s a Spring Grove story. Giants of the Earth Bourbon features a photo of Christian’s great-grandparents; Fence Jumper was inspired by a rogue contingent of local livestock. 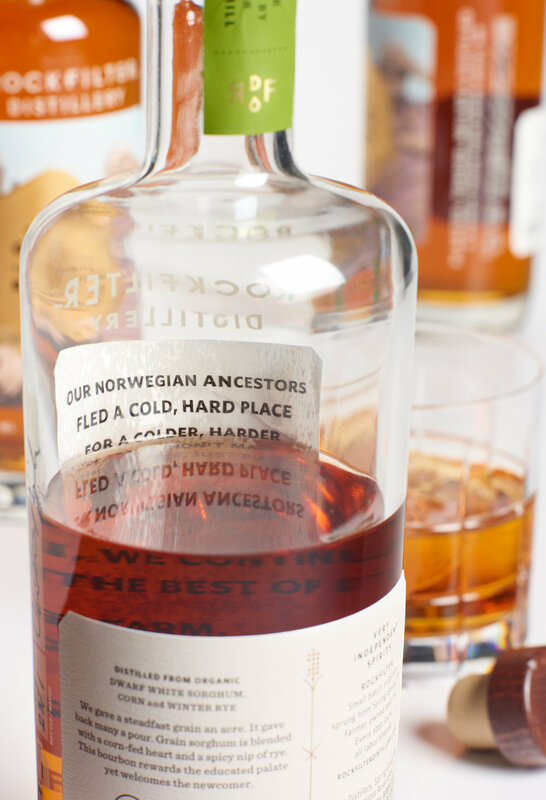 An embossed, foil-stamped gold rock partially obscures the images on the front labels, while the back side of the label is printed with a story which reveals itself as the bottle is emptied. The same screen printed bottle is used for all of RockFilter’s products; we chose it for its unpretentious, broad-shouldered shape. Each bottle is individually signed and numbered, and the whiskey’s proof is also hand-written and applied as a separate label. These elements add handcrafted authenticity, but also enable the client to variably age and proof their whiskey. The final result is a packaging design that’s as hardworking as the people behind the brand and as premium as their award-winning product. I designed this project with Sarah Forss at Werner Design Werks, with Sharon Werner as our creative director. Brand strategy + copywriting by Julie Kucinski. Packaging photography by Ken Friberg. This project has been recognized by the Tokyo Type Director's Club 2018 and Ad Fed Minnesota's The Show 2018.